After the pasta extravaganza on Friday and the fine dining on Saturday, I thought Steve would appreciate a low key, simple meal for Sunday. Chef Richard Reddinton’s first restaurant, Redd is a fine dining establishment that previously boasted a Michelin star; Redd Wood is his casual “Italian-inspired” eatery, i.e. pizza and pasta. We spent the afternoon wine tasting. 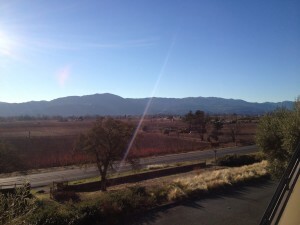 We enjoyed the exceptional views from Miner Family Winery. By 4:30pm we were in need of food to soak up the wine, so we arrived 2.5 hours early of our 7pm reservation. There was no problem seating us in the empty dining room. The menu is limited between 3pm and 5pm to salads and pizza. 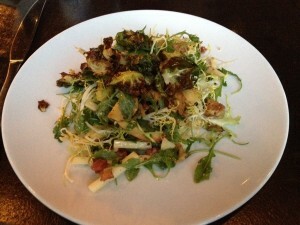 We started with the warm Brussels sprout salad ($13). It was one of the best salads I have had in recent memory. The halved sprouts were nestled in a pile of frisee, bacon, apple, and croutons, atop burrata and finished with fried Brussels sprout leaves. It was a perfect combination of flavors and textures: the creaminess of the burrata cheese against the crunch of the apple and croutons, the bitterness of the frisee, the smokiness of the bacon and the sweetness from the apple. I have to steal this flavor combination for my Christmas hor d'oeuvres, somehow. Stay tuned for that. 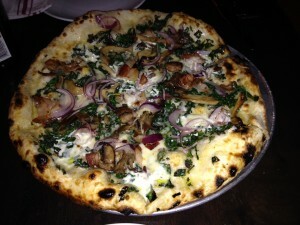 We shared a pizza ($16) topped with mushroom, pancetta, asiago, tallegio, kale, mascarpone, red onion. They have a wood burning fire, so the crust was crispy, yet tender with the desired charred marks. I think the red onion should have been sliced thinner, but that is a minute criticism, as the flavors of the toppings all worked well together. It was a delicious and affordable meal. Our server was very attentive, as we were his only table. 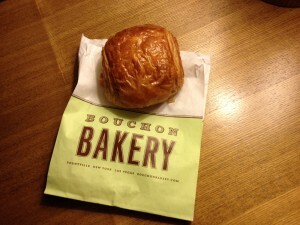 For dessert, we took a short drive to Bouchon bakery, where I purchased a chocolate croissant and a caramel macaron to go. To my dismay, once back at the hotel, I discovered they forgot the macaron. It was the biggest disappointment of the trip. I consoled myself by drawing a bath and eating my pastry in the huge soaking tub. This is how you know you are on vacation - enjoying a chocolate croissant in the bath while watching TV.